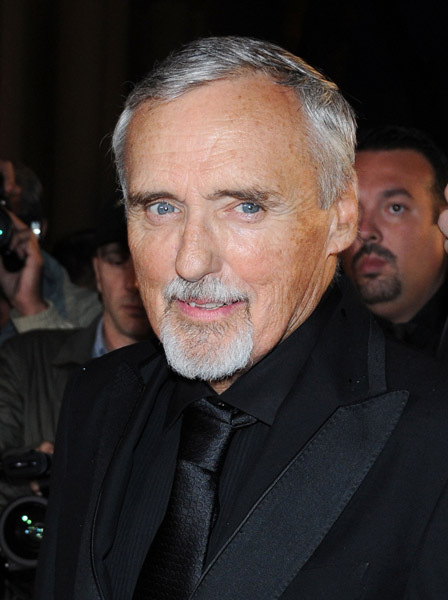 CHICAGO – Beloved actor and legendary easy rider Dennis Hopper lost his long battle with prostate cancer this morning at age 74. With a career spanning over the last half-century, Hopper is best known for directing, co-writing and co-starring in 1969’s counterculture classic “Easy Rider”. The script awarded Hopper his first of two Oscar nominations (the other he received for his memorable supporting role in 1987’s “Hoosiers”). The Hollywood icon died at his home in Venice Beach, Calif., on Saturday, May 29th, from complications due to prostate cancer. He was reportedly surrounded by his children at the time of his death. Hopper was diagnosed with the disease in late 2009, and by March of this year, the cancer had metastasized to his bones. That same month, Hopper made his last public appearance when he received his star on the Hollywood Walk of Fame. After “Easy Rider,” Hopper directed six more feature films: 1971’s “The Last Movie,” 1980’s “Out of the Blue,” 1988’s “Colors,” 1990’s “Catchfire” and “The Hot Spot,” and 1994’s “Chaser.” Hopper’s last major role was on television in the Starz series “Crash.” His final two projects, a show-business satire, “The Last Film Festival,” and the animated adventure, “Alpha and Omega,” are due for release this year. Our condolences go out to his wife, Victoria, and his four children. Heath Ledger dies at 28 on Jan. 22, 2008. Michael Jackson dies at 50 on June 25, 2009. Paul Newman dies at 83 on Sept. 28, 2008. John Hughes dies at 59 on Aug. 6, 2009. Farrah Fawcett dies at 62 on June 25, 2009. Sydney Pollack dies at 73 on May 26, 2008. George Carlin dies at 71 on June 23, 2008. Bernie Mac dies at 50 on Aug. 9, 2008. Anthony Minghella dies at 54 on March 18, 2008. Charlton Heston dies at 84 on April 6, 2008. Deborah Kerr dies at 86 on Oct. 18, 2007. Michael Crichton dies at 66 on Nov. 5, 2008. Don LaFontaine dies at 66 on Sept. 4, 2008. Stan Winston dies at 62 on June 16, 2008. Suzanne Pleshette dies at 70 on Jan. 20, 2008. Arthur C. Clarke dies at 90 on March 19, 2008. Jett Travolta dies at 16 on Jan. 3, 2009. Submitted by the padrino (not verified) on May 30, 2010 - 8:29am.